I’m so excited to be a part of the Derby Day Week Celebrations along with some amazing Kentucky Bloggers! There are a few traditions associated with The Kentucky Derby that are a must. 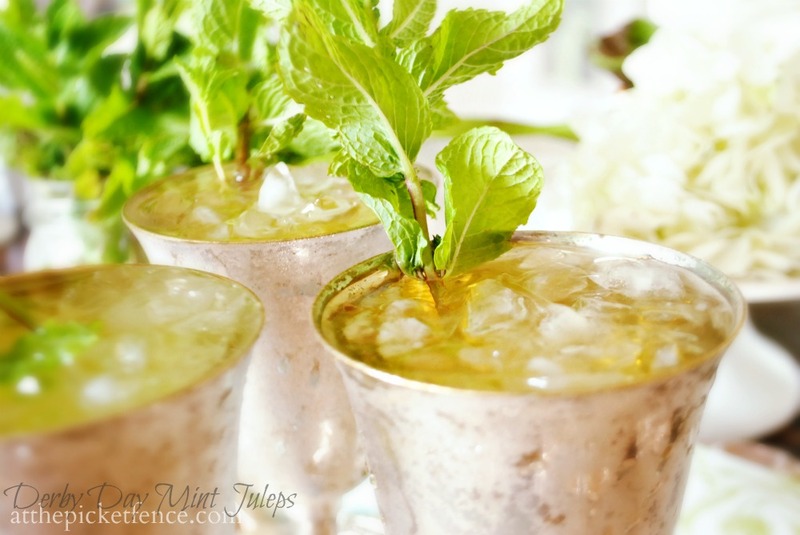 Horses, Hats…and Mint Juleps! First consumed in the late 1700’s, the granddaddy of cocktails, The Mint Julep, was traditionally served on Kentucky Derby Day. Comprised of a few simple ingredients, mint is the defining component of this popular Southern drink. Served with Kentucky Colonel Mint and a high quality bourbon (also a Kentucky native) this cocktail is sure to please the most discerning and sophisticated among us! and of course if you want to really serve these drinks properly…you must serve them in a silver mint julep cup! 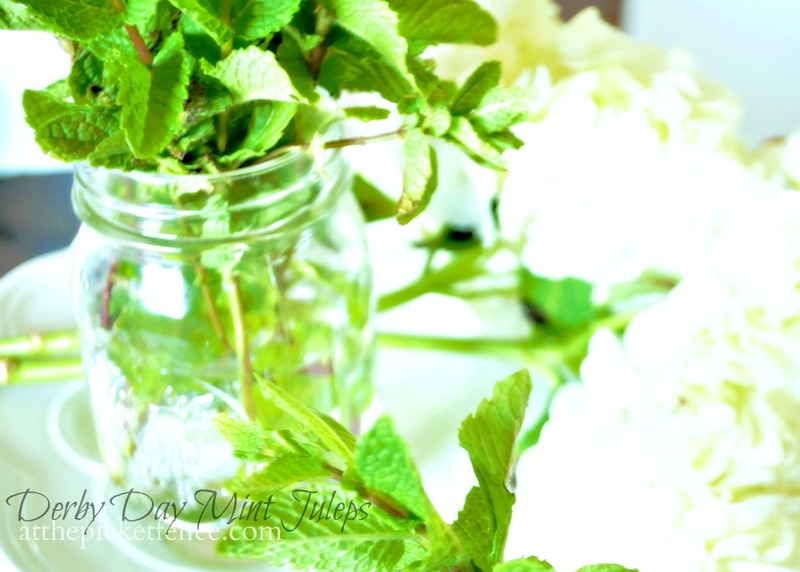 Muddle the sugar, one mint sprig, and the bourbon in a mint julep cup or rocks glass. The perfect accompaniment to a mint julep is a slice of Kentucky Derby Pie. 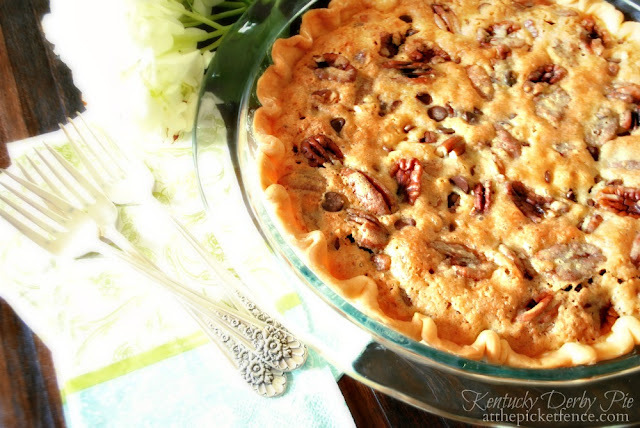 This is our families Kentucky Derby Pie recipe, and it couldn’t be a more simple but decadent pie to make. If you are hosting a Derby Party this Saturday, you can’t go wrong with serving these two classic Derby Day recipes, your guests will think you are a Derby Day Diva! Check out all of this week’s amazing Derby Day Posts from my fellow Kentucky Bloggers! We kicked off Derby Week over at The 2 Seasons, where we got a history lesson on the Kentucky Derby. Up next, the fabulous Carmel of Our Fifth House showed us how to incorporate the most important aspect of the Derby into our home decor, the horse…of course! Then we headed back over to The 2 Seasons for a lesson on hats and hat making! The lovely Kari Anne of Thistlewood Farm is teaching us how to monogram our own glasses (us Southerners love a monogram!) 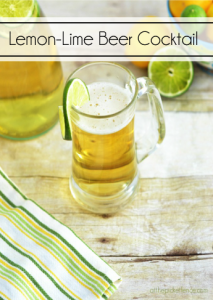 and is sharing a great Lemonade Mint Iced Tea recipe. and a big thank you to the fabulous mother daughter team of Janette and Jordan at The 2 Seasons for hosting this great Derby Day Party! Now ya ready for some fabulous features from last week?! This kitchen makeover from Blissful Blooms will definitely put a smile on your face! With all of these charming details, you wouldn’t believe how this space started out. It is definitely an amazing transformation! Our friend Richella from Imparting Grace shared her beautifully redone Guest Bedroom. Our bags are packed and we are on our way Richella! Two beds, two sisters…perfect, right? We promise not to jump back and forth on them like we did on the one’s at our Grandma’s house years ago! and since we’re hanging out in your bedrooms, we just had to share Erin’s, from How to Nest for Less, beautiful master bedroom makeover. 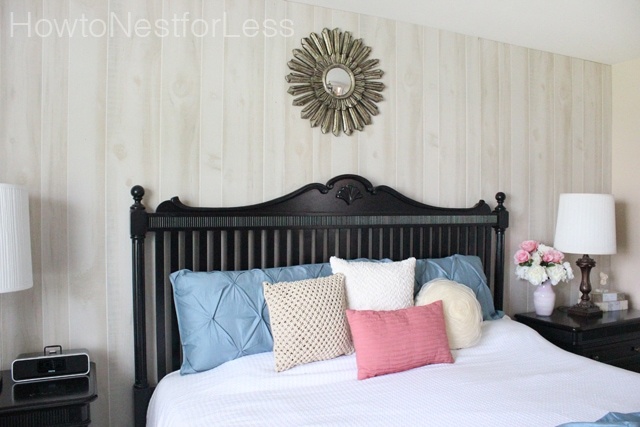 She installed wood paneling in her beautiful master bedroom makeover and gives a full tutorial on how they created this look, you could be installing some yourself in no time! Kristin of A Vintage Fairy did an incredible job on this PB Knock-Off! For literally a fraction of the price (the Pottery Barn piece was $999!) 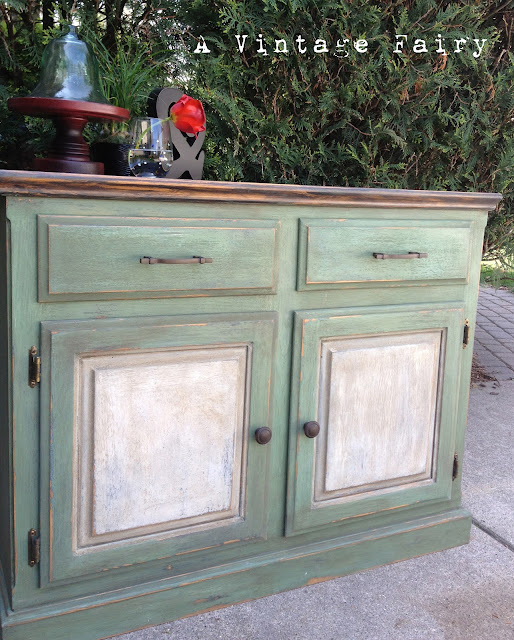 she gave this a wonderfully vintage look and we love the two tone paint treatment on the doors. 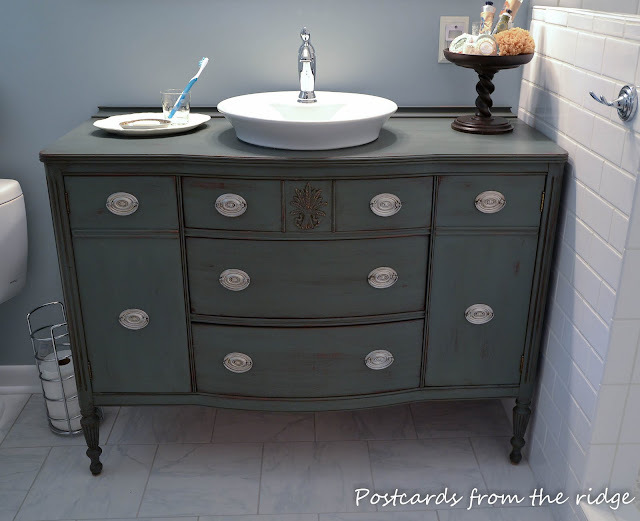 Angie from Postcards from the Ridge upcycled this their dining room buffet into this gorgeous bathroom vanity. She shares the step by step instructions of this beautiful makeover! This harlequin table makeover from Rukmini at Trumatter is fabulous! She shares how she painted it as well as how she was inspired be her Granny. Jo-Ann from Growing in Grace showed us how to make this darling House Number Flower Hanger! We love any kind of two-for-one project! Kendra from the The Good Life, Adventuring Through Goodwill, created this adorable ruffled dress…out of a bed sheet! Isn’t it adorable? We applaud your creativity and ingenuity! 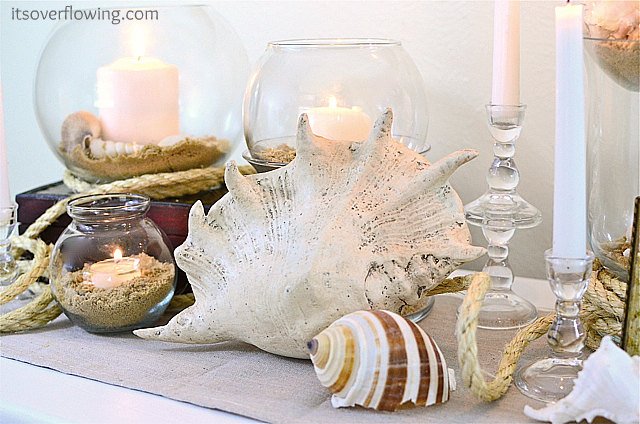 Aimee at It’s Overflowing showed us how to knock-off this beachy Pottery Barn vignette, for just a few dollars! Makes us so ready for summer! 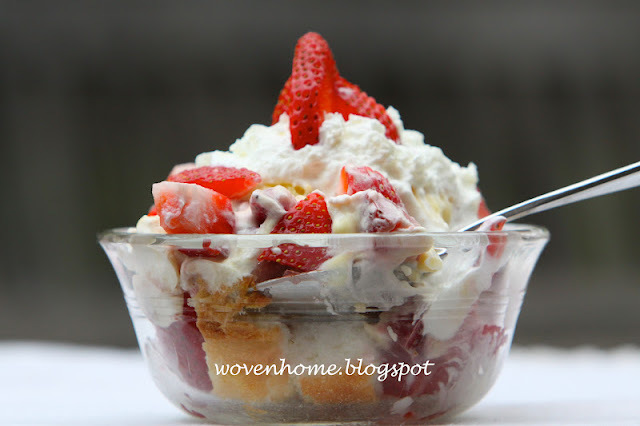 Rebekah from Woven Home shared this guilt free Strawberry Trifle with us last week…guilt free?! We’re all over that! 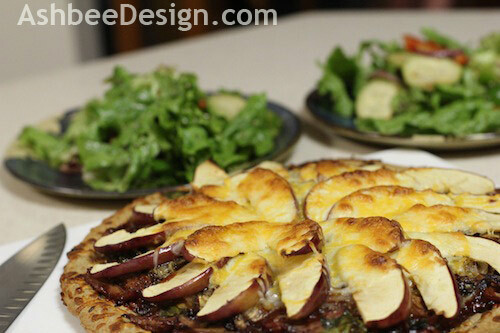 Pulled Pork Pizza with Caramelized Onions and Apples? Yes please! 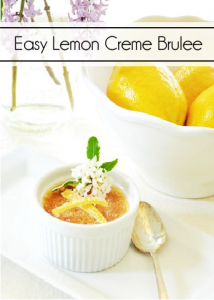 This recipe came to us courtesy of Ashbee Design and all we can say is that we might have drooled a little bit when we saw it. 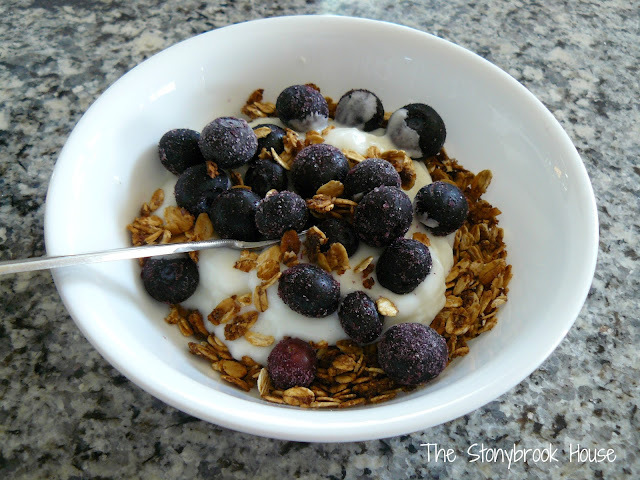 and Lori from The Stonybrook House shares her “world’s best” Homemade Granola Recipe with us, who wouldn’t want to start the morning out with a big bowl of such loveliness! Meredith of I Am a Mother Seeking, allowed us a glimpse into how she honored her daddy on the anniversary of his death by celebrating his life. Thank you Meredith for sharing this with us! If you were featured today (or have been featured in the past) please grab the featured at button code located on our Buttons Page found under our header! 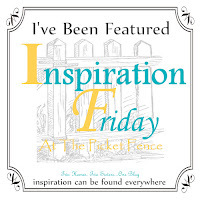 Link Up any post you’ve written that has Inspired You and will Inspire Others-it can be a home improvement project, craft, recipe, story, devotional…if it inspires link it up! And while it’s not a requirement, we’d sure love ya to be following along with us in some capacity! Below are some great options! 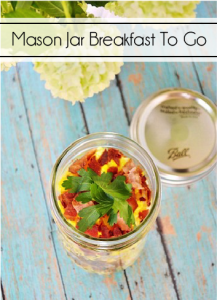 72 Comments on "Derby Day Recipes and Inspiration Friday No. 63"
I want a mint julep, those look delicious! Great features this week, as always! Thanks for hosting such a fab party girls, you sure are the hostess with the mostess. That bathroom vanity is stunning. Enjoy your derby! It sounds like a lot of fun!! Great Features! And thanks, now I want a Mint Julep! Super features, girls and thanks for hosting. I love what’s holding the Mint Juleps. Thanks for hosting. Great features, as always. I’ve never had a mint julep. Sounds great. Thanks as always for hosting. Great features!! Great features girls! Thanks so much for hosting! I would love to try a Mint Julep in one of the silver cups! Those mint juleps look awesome! Will have to make some Saturday. Thanks, as always, for hosting such a wonderful party. Loving Blissful Blooms kitchen – the mismatched stools are great! I wish I could put on a big hat, sip a mint julep and meet you at the Derby! But the Derby pie is the next best thing! Great features today. Thanks for hosting. Today I discovered iPiccy and Collages, seems to have a few less and a few more features than Picnik but whew! collages made easy again. Thanks for hosting, Ladies! I’ll take a slice of that pie while I check out the cute kitchen you featured. Have a lovely weekend! I love it! We are featuring the same bathroom vanity. Oh my, that kitchen, so cute!! 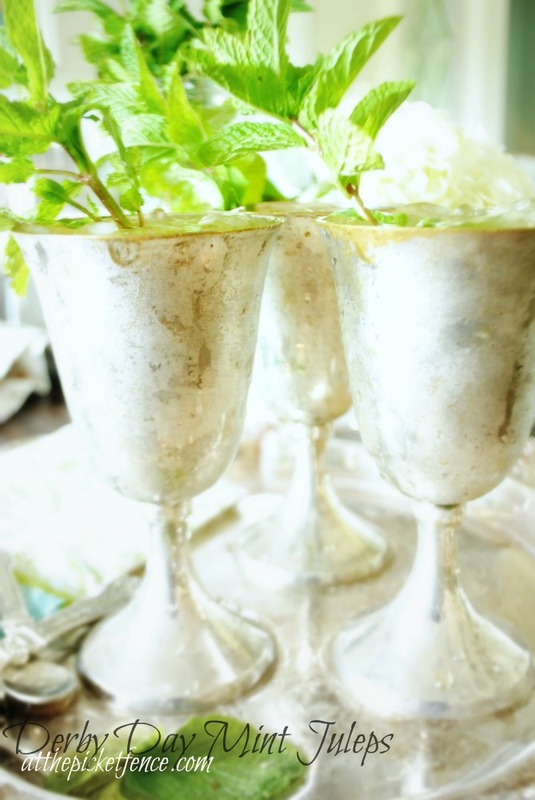 Those silver goblets of mint juleps looks gorgeous! Hope your Derby Day is filled with delights. Thanks for hosting ladies! Mint juleps aren’t too popular in CO, I’ve never had one, we’re into margaritas for Cinco de Mayo! A lovely mix of awesome features! ~Pernilla … Time to party! Loved all the features and really enjoyed the Derby Week Series. 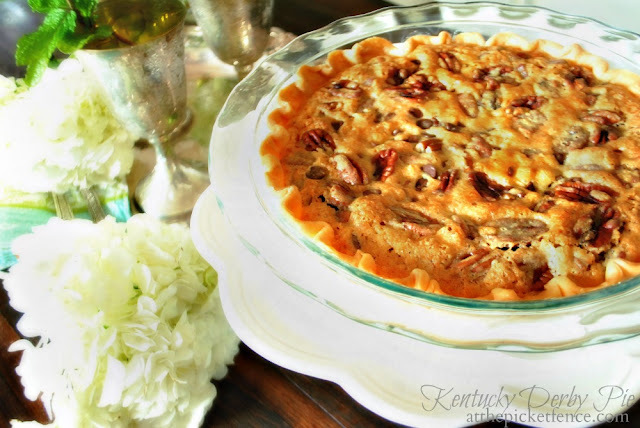 Gotta try the Derby pie recipe!…. I am going to try that pie! Thank you for the party and for all the great features you chose to highlight. Fun! How fun this all is…the drink and pie look amazing. Oh, mint juleps. Be still my heart! Mmmm. Those mint juleps sound so good. I can’t wait to try the recipe. Thanks so much for featuring our master bath vanity. I feel honored to have shown wight the other great features. I love the pb knockoff especially. Have a fabulous Derby weekend! Thank you so much for the great party, girls! Thank you SO much for featuring my kitchen! What a sweet surprise! Oooh, I have never had a Mint Julep before! I think there is one in my very near future – they look so good! an honor to be featured here, really, alonside those wonderful links which I am gonna visit immediately! I have never heard of Mint Juleps but I think now that I have Im gonna try and see how it unfurls. Thank you Heather and Vanessa for featuring my table makeover. You all have been very generous and cute and sweet and one of my biggest inspirations. Thank you for hosting! Great features. Have a fab weekend! Thank you for the feature! And, for hosting a great party! Your photo of silver mint julep cups is one of the prettiest things I’ve seen, and your Kentucky Derby week celebration such a fun idea. Thank you for hosting your party. What a busy week! Thanks for hosting. I am new to the blog, but am linked up and ready to start seeing this week’s offerings. Thanks for featuring me with such other inspiring posts! Your pie and julep photos are beautiful. They look like the BHG pros took them for you. That’s how good they are!!!! I will definitely be making your pie today. Thanks for participating in the Derby Week Event with us. Yum the derby pie sounds so good. I am going to be making my simple syrup today in preparation for our derby party and the famous mint juelps! Thank you so much for participating in Derby week and have a great derby day! THANK YOU so much for the feature ladies!! I truly appreciate it 🙂 Hope you have a fabulous weekend and thanks for hosting again! Hello! Thank you very much for hosting! I’m very happy joining from Argentina! You picked some beautiful features! I am going to have to try that pie of yours too! Thanks for hosting! The Kentucky Derby pie sounds yummy! Thanks so much for hosting.